I know the arrival of a Red Lobster in Times Square some years ago was a low point in the ongoing corporate raid on New York City under the administrations of Mayor Rudy and Mayor Mike, but the building of a Ruby Tuesday right across the street from it, at the north east corner of 43rd and 7th—that's got to be one of the seven signs of Apocalypse, right? Ruby Tuesday I have never gotten. Can anyone tell me the rationale behind this chain? It's one of those character-free family eatin' joints, right? Like Houlihan's or Bennigan's or whatever. But what's with the psychedelic name? I assume they didn't hatch a deal with the Rolling Stones way back when, but the name sure as hell zooms you back to 1967 and images of drugs, war and hippiedom. Yet, that aesthetic is as far as you can get from these anonymous dining halls. 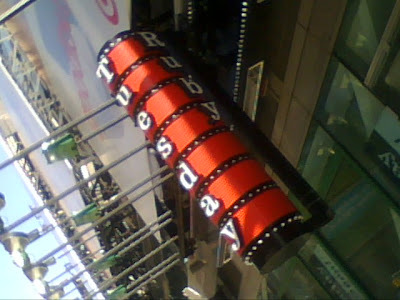 Are we supposed to see "Tuesday" and think "TGI Friday's" and go "Oh, it's that kind of place." Or do they just think Ruby Tuesday is just a cute, cheery name? Are they that clueless? Then there's their slogan, "Simple Fresh American Dining." I'll tell you what simple fresh American dining means to me: a picnic in the park. Not temporary imprisonment in an airless, joyless, tasteless wasteland. Wikipedia tells me that "In 2007, the restaurant will be moving out of the `bar-and-grill segment' with changes including `higher-quality menu items,' `fully upholstered chairs', and `premium wines and beers.'" I'm sorry. Fully upholstered chairs? My mistake. Rudy Tuesday does belong in swanky NYC. We're all about upholstered chairs. This is a very funny article. Having lived in Times Square while it re-disnee-fied, I have to ask: Has there ever been a good restaurant in Times Square large chain or not? Even the Theatre district has some wildly mediocre restaurants. I've also never heard anyone say "Hey let's go to Times Square and get some good food." Times Square is the official home of the $14 Hamburger. It started with the All Star Cafe, and continues with Ruby Tuesdays. Actually a Sizzler in Manhattan was nothing new. In the late 80's and early 90's, there was an outpost in lower midtown at 36th and Broadway. And don't forget about the late lamented Beefsteak Charlie's. Pitchers of watered down sangria and the famous shrimp and salad bar! No kidding about Ruby's. What are they thinking? Just out of curiosity, I looked at the new menu that Ruby's is bragging about. To call this a menu change isn’t fair. It’s a complete lobotomy. For the seafood lover, Ruby’s is proud to offer Salmon, Tilapia, Shrimp, and Crab Cakes. Also on the menu are Gourmet Pot Pies, Chicken Fresco, “Handcrafted Burgers”, and… wait for it…. Quiche. I don’t even know where to start. QUICHE for god sakes!!!!! Somewhere, some corporate executive thought this was a really good idea. Sure, it might be nice to visit a restaurant that specializes in fresh, well prepared seafood and other specialty chicken/beef dishes. Is that place going to be RUBY TUESDAYS? How many of you are going to run down to your local Ruby’s for QUICHE. Anyway, good post. I think you all are clueless. Why wouldn't you want to eat at a restaurant whether its a chain or not that offers good quality food, adffordable prices, friendly family-oriented atmosphere and a place where standards are upheld by corporate policy? I would take a chain restaurant over a place not continuously monitored anyday!!! You are not speaking from knowledge in regards to Ruby Tuesday, maybe you should try it, you might like it. Ruby Tiesday's, better or mini burgers? Can't make up thier minds? Salad or Garden bar? Can't make up thier minds? Please come in and eat. Come in and support the servers and bartenders scams. Need the extra funds at $2.00 per hour. I totally agree with this gentleman and his article. I worked at "Ruby Tuesday" and I Personally wouldn't eat there. Not even The "Fresh Garden Bar" Nothing is fresh. They treat their employees like crap and manipulate them to get what they want done for FREE LABOR. I have worked at Fine dining restaurants and what their trying to do is a JOKE. Let me just say something. Who came up with crab cake benedicts on a HAMBURGER BUN! Like the saying goes "never judge a book by its cover" But unfortunatly for them I wouldnt want to get past the cover of that book. The original, running Jeremiad on the vestiges of Old New York as they are steamrolled under or threatened by the currently ruthless real estate market and the City Fathers' disregard for Gotham's historical and cultural fabric. Est. January 2006. Sitt's Coney Island "Dead in the Water"? 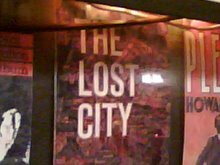 One of the old book jackets lining the walls of Chumley's. Eternal Shame on Bloomberg, the City Fathers, and the powers that be that this cultural landmark has STILL not been saved and reopened. 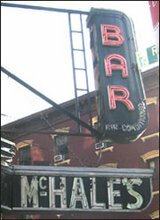 The late, great McHale's, the death of which inspired the birth of this blog.